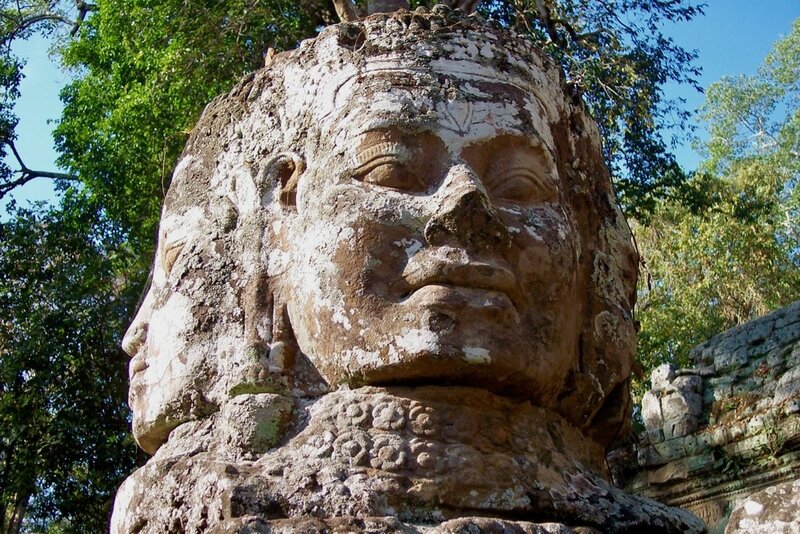 If you have not yet been to the Angkor Temples, time to pack your bags. 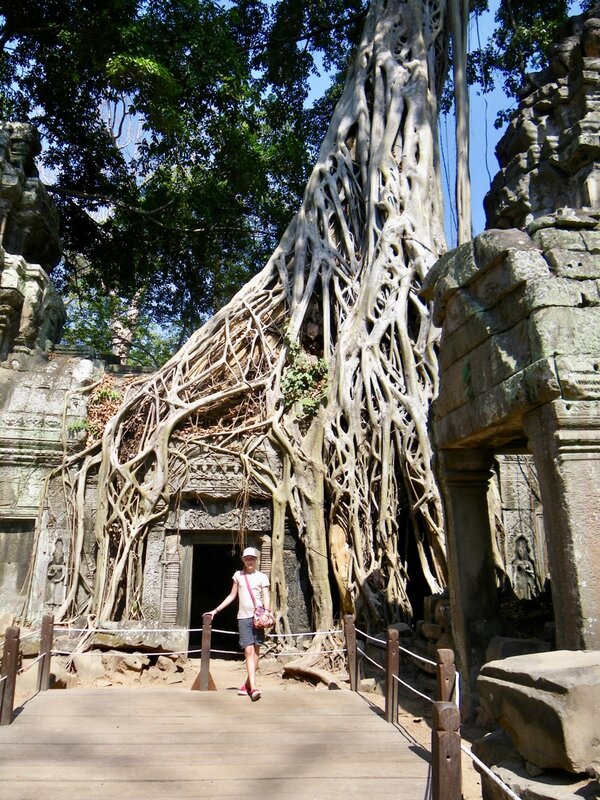 Built in the 12the century, it is a huge complex of many temples including my top 5 favourites: Angkor Wat, Ta Prohm, Bayon, Angkor Thom and Banteay Srei. Except for Banteay Srei, these 4 are close to each other and can be visited together. The other highlights are: Baksei Chamkrong, Banteay Kdei, Banteay Samre, Baphuon, Chau Say Tevoda, East Baray, West Baray, East Mebon, West Mebon, Terrace of the Elephants, Terrace of the Leper King, Preah Ko, Kbal Spean, Krol Ko, Phnom Bakheng, Khleangs, Near Pean, Phimeanakas, Phnom Krom, Lolei, Prasat Ak Yum, Prasat Kravan, Preah Khan, Preah Palilay, Preah Pithu, Pre Rup, Spean Thma, Srah Srang, Ta Nei, Ta Som, Ta Keo, and Thommanon. Bayon offers the giant faces of Buddha and Angkor Thom and Ta Phrom those big tree roots overpowering the temple ruins and of course, scenes of Angelina Jolie in the movie, Tomb Raider. To visit the Angkor Temples and sites at the Angkor Archaeological Park, you need an admission pass that you can get at the entrance. This varies depending on age and number of days you want to spend in the park. For those who only have a short holiday and plan to be at the temples for just one day, get your pass in the afternoon (around 4:30p.m.) and watch the sunset. Then, wake up early (around 5 a.m.) to watch the sunrise and go on to visit the other temples. If you have more time and want a bit of adventure outside the park, drive to Banteay Srei, the most exquisite of the temples. It is about 30 minutes drive from town. You can also arrange a day trip to the less visited temples of Beng Mealea, Phnom Kulen, Kbal Spean and Koh Ker. Add to this staying with a Cambodian family in the village. Beng Mealea is the temple you saw in the family adventure film, Two Brothers, a story of two tiger cubs separated from each other and the journey that ensued after the separation. You may not want to part with your bed at 4:30 in the morning, but I tell you, this is the best time to go and see Angkor Wat. There is nature's show of colours as the sun hits the temple. The orange hues you see in the painting...that is what you will enjoy. The painting hardly captures it. But the best part is: You can enjoy the temple without thousands of others getting in your way. You are not sweating much so you can listen to your guide. And after a visit to the main temple, Angkor Wat, go back to your hotel to enjoy that free breakfast. While watching the sunrise if you stay close to where the coffee shops are, they offer chairs around a very shallow swamp where as the sun rises you can view in the water the contours of the temple. Get a chair so no one bothers you once you have a chair. That goes with coffee, too. If you don't like to be bothered early morning, stay close to the entrance walls. Then you can enjoy watching the sun as it shows itself gradually. 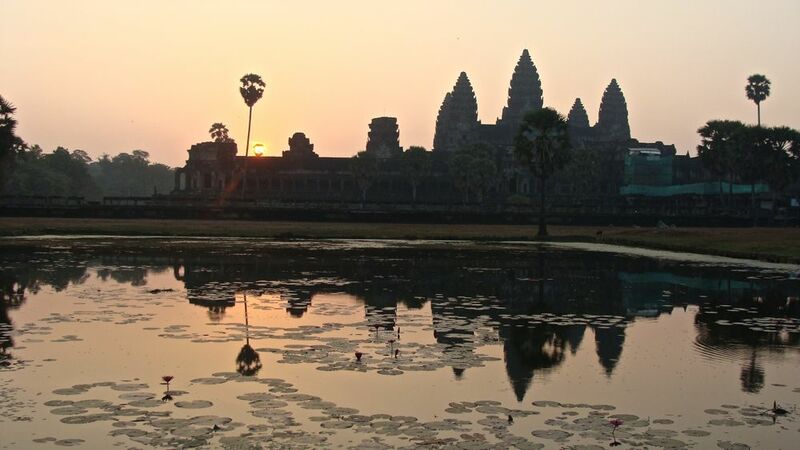 Enjoy not only the the sunrise but also the sunset at Angkor. It is worth doing just for the experience of seeing so many people waiting for the excitement. The walk to view the sunset is a bit tiring as it is going up and climbing up the temple ruins can be challenging. Still, it is an experience. If riding the elephant is your dream, the elephants can take you to the viewing point. But if you want to save some money, the elephants can take you for a short ride around the square as they wait for their passengers. For a dollar, you can have a picture of yourself riding an elephant. These Apsaras or celestial dancers are one of the mythical characters that have been the carvers' favourite in the temples of Angkor. There are around 2000 of these apsaras in the temples. 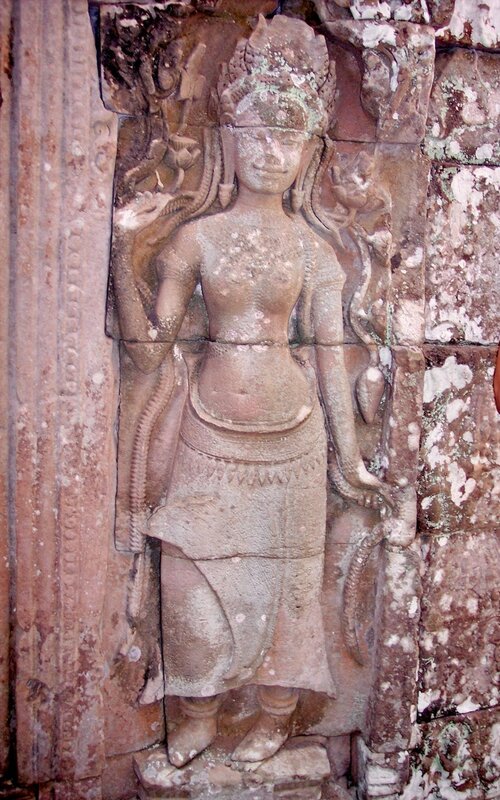 The Khmers have developed traditonal dances around many of the myths and this is now called Apsara Dancing. You can watch this performance and it is worthwhile. Some places offer dinner and dance and your hotels can easily arrange attendance to this. Go early so you get a good seat. An easy to book place and popular to tourists as the buffet is quite good as well as the performance is Koulen Restaurant. Raffles Hotel also has performances certain days of the week. My personal favourite is the performance in the Apsara Theater connected to the Angkor Village Hotel which also has daily performances. Have time in your schedule to appreciate each temple you visit. Visit one temple in the morning and another in the afternoon. Go early in the morning and late afternoon so the heat does not interfere in your appreciation of the temples. Hats and umbrellas are precious. It is better to get a knowledgeable guide. You can arrange this with your hotel. 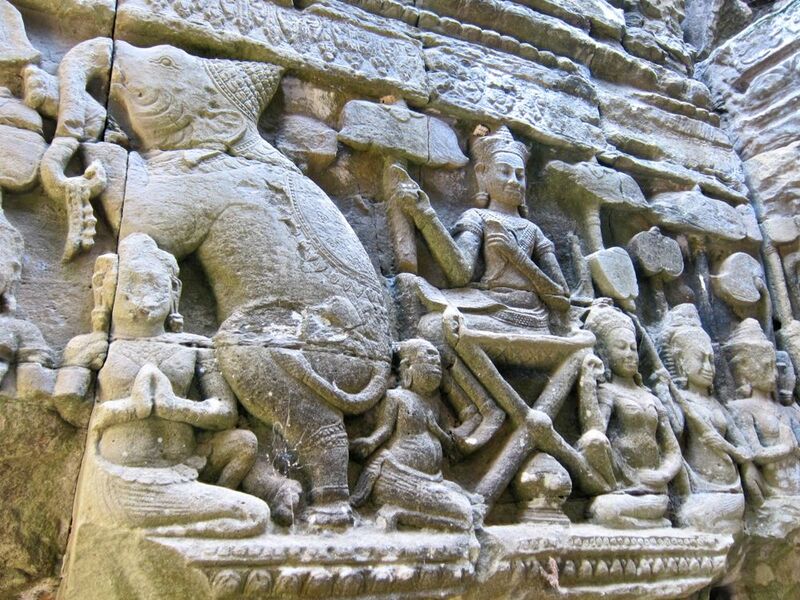 Many artifacts in the Temples of Angkor like carvings have been stolen in the past. It is disheartening when one sees how limited are the displays in the museum at Siem Reap because many of the artifacts have been stolen, shipped to Bangkok and sold to private collectors. There is hope that some of these collectors might return the artefacts so these can be displayed in the museum here. If you're one of those who bought one of these stolen artefacts, would you not be proud to be a donor to the museum of Siem Reap? More areas around Angkor are now being discovered. It must be remembered that at one point, Angkor was the largest metropolitan area in the world with up to 1 million people. When you're in Angkor and have time to spare, have a day trip to another world heritage site, Preah Vihear, the temple contested by Cambodia and Thailand. There is also Beng Mealea which is just about an hour drive from Angkor. 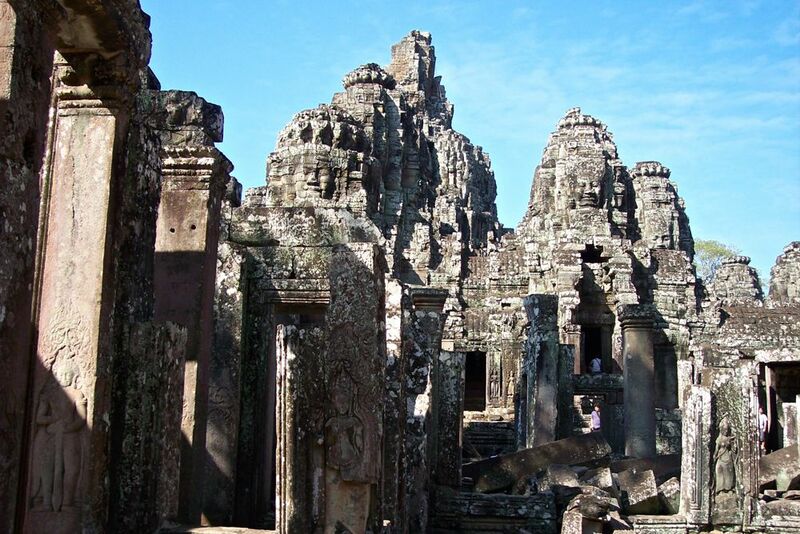 Have you been to Angkor? Please share your experience below.